Babies are fragile little things and they need to be properly shielded from any potential injury, fracture or even the slightest discomfort. One of the best ways to make sure that your baby is comfortable is to place them in a baby carrier that fits their size, age and weight. Although you may have heard a few reasons against placing your baby in a carrier, be sure that there are more reasons why you should definitely get one. So, if you’ve been thinking about getting one for your bundle of joy but have been slightly hesitant about it, here are a few parameters you should take into consideration before actually proceeding with the purchase (and you’ll see why we’re absolutely FOR buying one). Why owning a baby carrier is good? Flexibility must be the first reason we are pro buying a baby carrier. Once placed in it, the baby will feel comfortable, while mum’s hands will be absolutely free allowing her to actually do stuff (cooking, folding laundry, office work, grocery shopping, etc) without leaving her baby in a bassinet or bed, constantly wondering if they are okay. Another very important aspect of using a baby carrier is the fact that you’ll actually be bonding with your baby by carrying them close to you. Anyone who lives in a big city and uses public transportation knows just how horrible folding up a stroller every time you need to get on or off the bus can be. Another situation where owning a carrier is practical and convenient. They are easy to bring on the go and are definitely a time-saver! Anyone mentioned breastfeeding in public? Well, we’ve all done it and we all know how weird and uncomfortable it can get. Carriers make nursing in public pretty easy and carefree because the whole process is done very discreetly. Also, having your baby close to you will stimulate your body to produce milk quicker and easier. Strollers are pretty expensive, while baby carriers are actually pretty reasonably priced. It is not uncommon for some parents to skip the whole stroller drama and go straight to the carrier – it’s simpler, more convenient and more budget-friendly. For all mums and dads who want to keep their exercising routine uninterrupted but don’t want to leave their baby alone, a carrier is a perfect solution. 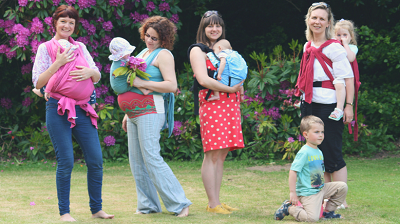 Wearing your baby while walking is actually recommended to all new mums as it strengthens the core while keeping the baby close at all times. And when mums want to go for a run, it’s dad-carrier-time! A baby wrap is wrapped around mother’s torso and both shoulders (sometimes one, if that feels more comfortable). Baby wraps are very versatile and are often made of natural (organic) fabrics. You’ll find the best organic wraps at MumsInCyprus.com, and a range of other options with Moby Wrap, Baby K’Tan and Boba Wrap. Slings are a sturdy piece of cloth often worn over just one shoulder and across your torso, fantastic for newborns and tiny babies. Slings are versatile and can be either padded or unpadded, made of various fabrics and with or without adjusting rings. Try finding the perfect sling carrier with P-Sling, Maya Wrap, and Comfy Joey. Soft structured carriers usually have two shoulder straps and buckles, and are made of soft padded materials sewn into a structured seat. These carriers are great for carrying the baby for long periods of time or doing any outdoor activities as they are pretty ergonomic and comfortable for both the mother and the child.